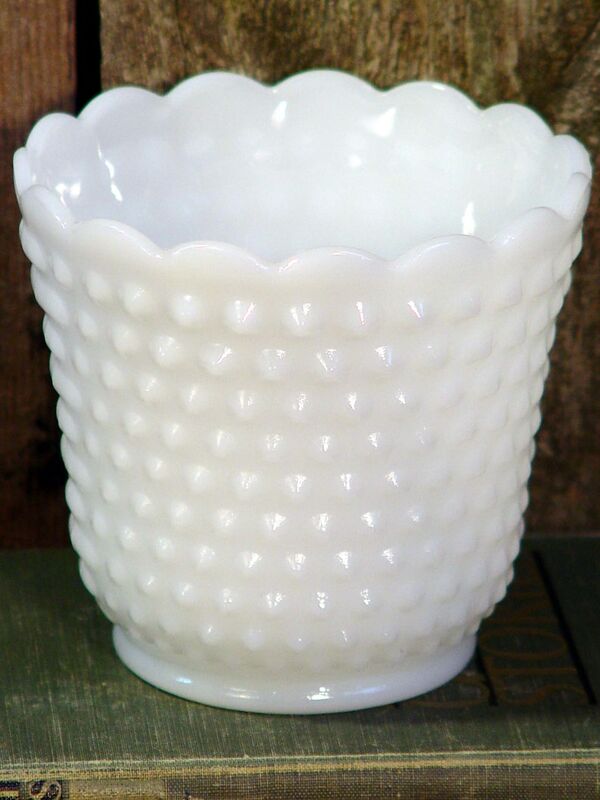 This pretty hobnail pattern Fire King milk glass vase stands 5" tall and is in great condition. These wide mouth beauties make great vases of course, but they are also wonderful caddies for pencils and art supplies for the desk. Extra snazzy in the powder room filled with cotton balls. Tuck a votive candle inside and these pretty vases simply glow. You'll think of something clever, I'm certain. Surrender Dorothy. Everyday vintage awesomeness! Surrender Dorothy offers a vast and never-ending array of affordable and very cool antique and vintage finds from Maine; fashion and home decor treasures that you won't find elsewhere. You can always expect to find the unexpected here. Resistance is futile. Surrender Dorothy offers 24 hour a day vintage shopping therapy for the hopelessly retro addicted. We Have Hundreds Of Fun Vintage Finds To Feather Your Nest With.